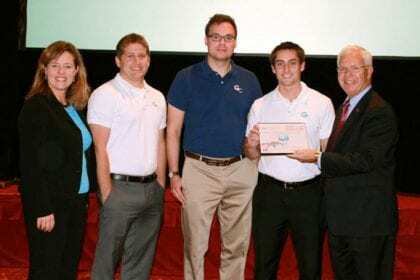 Gel Combs LLC, a company founded by Matt Copeland, Ben Cox and Brandon Walker, was one of five honored at the 2014 Bioscience Vision Summit’s Emerging Company Showcase. BioForward, promoting innovation in Wisconsin’s growing biotechnology industry, hosts the summit annually. The showcase features early stage companies that have transitioned successfully out of research and development, with good proof of concept for their products, says Brian Moeller, operations manager at BioForward. Gel Combs has done just that, manufacturing customized combs for gel electrophoresis work, compatible with systems from market leaders like Bio-Rad and Fisher Scientific. Gel electrophoresis allows for the separation of macromolecules, like DNA or proteins. Combs are used to make separate wells in the gel for different samples, useful for comparison and analysis. The idea for the new gel combs arose when Copeland, a postdoctoral fellow in the department of chemical and biological engineering at UW-Madison, was looking for a custom gel comb for his research. Ben Cox, Matt Copeland and Brandon Walker of Gel Combs LLC are honored at the 2014 Bioscience Vision Summit, hosted annually by BioForward. Photos courtesy of BioForward, Citrus Marketing. They made a 9-well comb the next day and realized the product was easy to fabricate and may be of interest to other research groups. Walker, also a member of Morgridge’s medical engineering team, says they’ve gotten positive feedback about the combs, but the challenge is getting the word out that possibilities for customization exist. The team has gone through several iterations of the design after getting feedback from users and offer three standard comb designs: a 9-well comb, a 17-well comb and a gel extraction comb. While functionality is the key component, the Gel Combs group has found the design and bright colors also appeal to their customers. The combs are primarily manufactured in the Morgridge Institute fab lab, but the team also takes advantage of the resources at Sector 67, a popular Madison maker space. 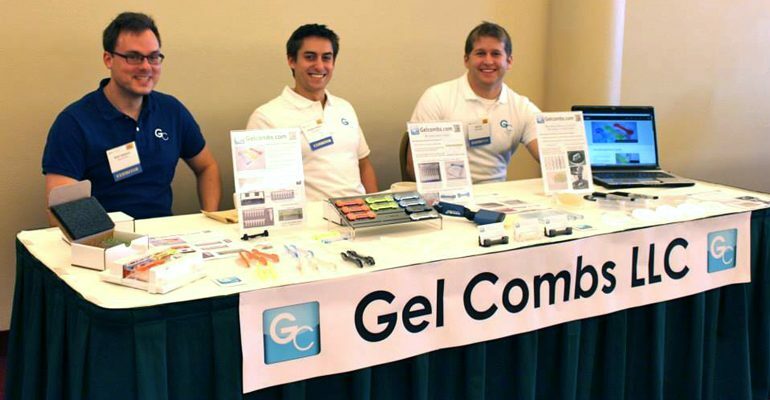 The BioForward event gave more recognition to the products and allowed the Gel Combs team to make connections that could inform their future efforts. See a presentation about Gel Combs below, given by Matt Copeland at the PechaKucha event held in August at the Monona Terrace.